In honor of grabbing a coffee on Tuesday morning with Mark Oestreicher (aka “Marko”), I have decided to post a contest over the weekend. Marko had a blog when he was the President of Youth Specialties entitled, “YSMarko.com.” Since leaving Youth Specialties he has changed his blog to WhyIsMarko.com. Anyway, his photo in need of a caption contest is where I stole got the idea to do my What Am I Thinking (W.A.I.T.) contest. So, think of what these folks may be thinking. Post your comments and see if you make it into the running. I’ll post a winner after the weekend. If you’re comment doesn’t appear right away, no worries, I’ll approve it the next time on sign-on. The winner gets a Youthmark t-shirt. Congrats to “the wifey!” From the second I read this, I had a feeling it would land #1. Great stuff, what a witty individual she must be. Go grab your t-shirt from the stash! …and then I harnessed the eagle egg power and ripped my blouse! 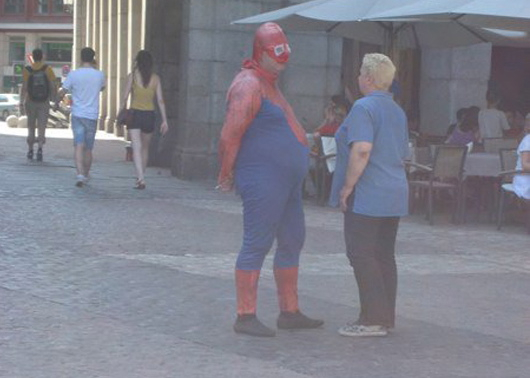 Spiderman and Mary Jane, getting ready for the 30-year high school reunion. WHat? Do I have to hang upside down to get a kiss? So I’m a bit out of shape… Even superheroes have to take furlough days now. I WON! I WON! I WON!!! What a witty individual I must be.